View the entire table of contents for the Dec. 15, 2010 issue. The state may still be better known for apples and computer codes, but over the past couple of decades it has become a world-class wine region, and one that is only going to get better with time. Whether you favor Riesling or Chardonnay, Cabernet Sauvignon, Merlot or Syrah, Washington can deliver pure fruit flavors and distinctive character at prices that won't break the bank. Wine Spectator editor at large Harvey Steiman explains. 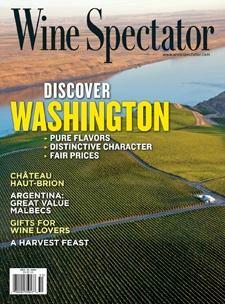 For the full article, check out the new issue of Wine Spectator, on newsstands November 23, 2010.